Gently rock back and forth from the comfort of your reclining chair fit with a rocker base. The rocking movement can help relax you as you sit and watch your favorite TV programs or as you read a book after a long day. A rocker makes a great addition to a nursery as a soothing place to rock your baby and cherish those precious moments with your little one. Traditional style and luxurious comfort combine to create this elegant recliner. 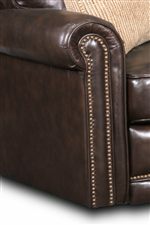 Classic nailhead details accent the arms and footrest and complement your choice of upholstery. An exterior handle reclining system makes this rocker recliner functional and comfortable. The frame is made from solid hardwoods that are covered in foam and sealed to provide a shape that is comfortable and built to last. Rolled arm rests complete the classic design. 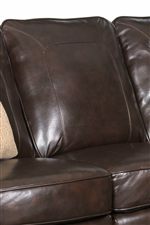 The Jasmine Traditional Manual Rocker Recliner by Lane at AHFA in the area. Product availability may vary. Contact us for the most current availability on this product. Recliner Mechanism Durable tempered steel mechanisms are precision engineered & balanced for maximum comfort and ease of operation, featuring shoulder riveting in major wear points, lubricated pivot joints, Delrin spacers, and an oven-baked finish. Hands-free ottoman closure. Frame Construction Frames feature engineered hardwoods, and mortise and tenon joint construction for stronger joints. All hardwood components are made from kiln-dried lumber, double-doweled, glued, corner-blocked, and incorporate 8-gauge steel action brace construction. The pitch and size of each piece is engineered for generous comfort. Frames are built with 20% more wood for extra durability. Padding & Ergonomics All cushions are environmentally safe, using soy based foams. Seat Support 8-gauge sinuous steel springs attached to a sturdy hardwood/plywood frame with special lined clips for noise-free, lifetime easy seating. Traditional in design the Jasmine collection of motion upholstery will create a timeless look within your home. Quality and comfort were top priority during the construction of each piece and it shows through each detail. 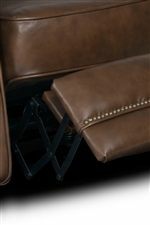 Rolled arm rests are tastefully adorned with nailhead trim which continues onto the base board and footrests of the pieces. Available with both manual and power reclining mechanisms you can chose which system would fit your lifestyle best. There are several hundred color and cover options available for this set and every item is made custom for you. Create the perfect look for your home with this classic and elegant collection. The Jasmine collection is a great option if you are looking for Traditional furniture in the area. Browse other items in the Jasmine collection from AHFA in the area.